The metal 3-D printing market is currently dominated by high-end applications, which make it inaccessible for small and medium enterprises, fab labs, and individual makers who are interested in the ability to prototype and additively manufacture final products in metal. Recent progress led to low-cost open-source metal 3-D printers using a gas metal arc welding (GMAW)-based print head. This reduced the cost of metal 3-D printers into the range of desktop prosumer polymer 3-D printers. Consequent research established good material properties of metal 3-D printed parts with readily-available weld filler wire, reusable substrates, thermal and stress properties, toolpath planning, bead-width control, mechanical properties, and support for overhangs. These previous works showed that GMAW-based metal 3-D printing has a good adhesion between layers and is not porous inside the printed parts, but they did not proceed far enough to demonstrate applications. 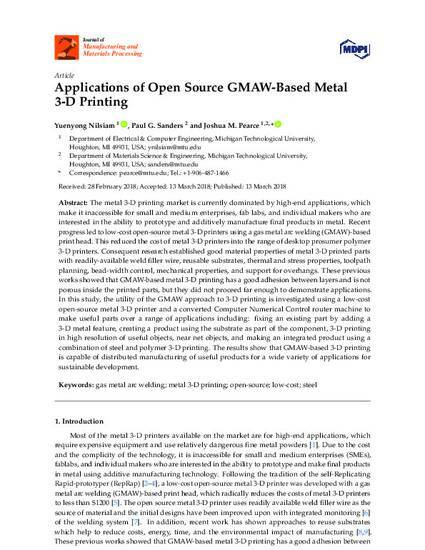 In this study, the utility of the GMAW approach to 3-D printing is investigated using a low-cost open-source metal 3-D printer and a converted Computer Numerical Control router machine to make useful parts over a range of applications including: fixing an existing part by adding a 3-D metal feature, creating a product using the substrate as part of the component, 3-D printing in high resolution of useful objects, near net objects, and making an integrated product using a combination of steel and polymer 3-D printing. The results show that GMAW-based 3-D printing is capable of distributed manufacturing of useful products for a wide variety of applications for sustainable development.